There’s no denying that Nikon moving away from two compact flash slots on the D4 has been met with some criticism. And I was one of the unimpressed people thinking about the need to carry two different sets of memory about. But, when you see this new technology in action clearing over 70 RAW files from the D4 in under 20 seconds, you can’t help but appreciate that things change. And yes, although change can be for better or worse, with the PCI Express based XQD’s potential for incredibly fast transfer rates and huge storage, it certainly doesn’t look like a change for the latter. So, following on from my D4 initial mini review, and continuing with my on-going thoughts on the camera as I use it more, here’s another quick video to entertain my fellow gadget geeks out there, plus my own thoughts about the pro’s and cons of the early days of the XQD memory card. But first up, here’s the video, so you can fully appreciate the speed compared to the already very fast Sandisk Extreme Pro compact flash card. Fast. I’m sure you’ll agree. With the XQD card’s speed allowing you to take an extra 9 RAW files, and clearing them two seconds faster than the CF. And whilst that might seem like an ok difference, but nothing major, don’t forget you can take another 22 images on the D4 in those two seconds! 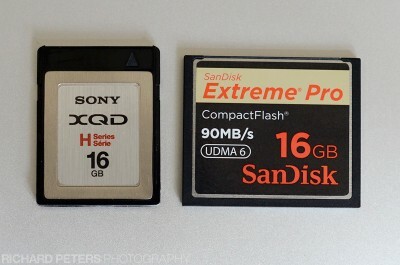 In terms of size, an XQD card has a smaller footprint than compact flash but it’s not as small as an SD card. To be honest. I actually quite like the size, and the way it push clicks in to place both inside the D4 and the card reader. And of course we’ve seen XQD is fast. Very fast. At the time of writing, this first generation card is faster than any other card on the market. And so I can see completely why Nikon opted to include it in the fastest camera they have ever made. But of course let’s not get carried away, like all good things, there are a few negatives to balance it out. First up, if you’re an Apple user like myself, then at the time of writing this, there is currently no easy way to transfer files from the card to your computer at a speed that takes advantage of what the card offers. This is because Apple do not have USB3 ports nor is there a Thunderbolt card reader. This is frustrating as I have become used to the ultra fast card to computer transfer times my FireWire 800 card reader gives me. So it’s safe to say, as an Apple user, if I hadn’t received a free card and reader I wouldn’t have been too quick to jump on board and buy any cards with my own money because of this. Also, the omission of a USB3 port on the D4 seems a strange one! Let’s also take a moment to think about the Nikon D800. With it’s 36mp sensor and huge files, you’d have thought it was the perfect candidate for this ultra fast new memory. But with the D800 originally scheduled for release in mid 2011, and then delayed due to all the natural disasters out in Japan it arrived later than planned. And so, we can only put the decision not to include it in the D800 due to the camera being completed on the drawing board before XQD was a certainty. When you also consider the D800 does have the USB3 port, it almost feels like both cameras are slightly handicapped in terms of making the most from ultra fast transfer speeds. The other downside is more of a theoretical one about the future of the format. There is a certain amount of worry that XQD doesn’t take off the way Nikon and Sony would like. Currently no other card manufacturer has said they will be making them, and as it stands right now, the D4 is the only camera in the world that uses them. Not even the pro flagship Canon 1DX uses them, instead opting for dual compact flash slots. So the way I see it, until the other manufacturers jump on board (we’re all looking at you Sandisk and Lexar), there is a very good chance no other camera manufacturer will take to XQD anytime soon. So in the meantime, do the D4 owners of the world start collecting these new cards in the hope Nikon have seen the future in some sort of Steve Jobs sixth sense kind of way, and that the industry will fully support it. Or, do we hold off just in case it all falls flat on it’s face and the D4 is only camera they produce that uses them and we see a D4s with dual compact flash – making our eagerly purchased next generation cards useless again! It’s potentially a bit of a stand off. Card manufacturers not making them until cameras support them, but cameras wont support them until more manufacturers make them! Like I said above, as much as I don’t relish the thought of having to carry two different card types with me, I get why Nikon did this. They wanted to be first with the latest memory card technology, but they couldn’t put dual slots in and leave out compact flash, as the Nikon world would have gone even more nuts. So, it seems the D4 is hopefully the bridge camera to introduce us to the future and get us ready for things to come. I used the 16gb Sony XQD that came free with my D4. For those of you who have been in space recently (or anywhere else that doesn’t provide a very good internet connection), the initial deliveries of the D4 came bundled with this, and a USB3 card reader in the box. A very nice way to introduce us to the format and what it offers, and I guess also a move designed to minimise the risk of photographers not buying in to an unknown technology without being able to try it first. At the end of the day, all technology moves on, and what once was the latest and greatest becomes obsolete. After all (and the younger readers may have to Google this), I remember when a 1gb IBM or Hitachi Microdrive was the card to have, but that was superseded by compact flash as the need for storage size and transfer speeds increased. So although early days, I really do hope this new card type doesn’t just turn out to be an embarrassing blip in the Nikon DSLR road map like so many people are predicting. All I know is with that incredible speed (and that will only improve), if you shoot sport, action or wildlife, there is no doubt that an XQD equipped D4 is a very powerful camera to have at your disposal!